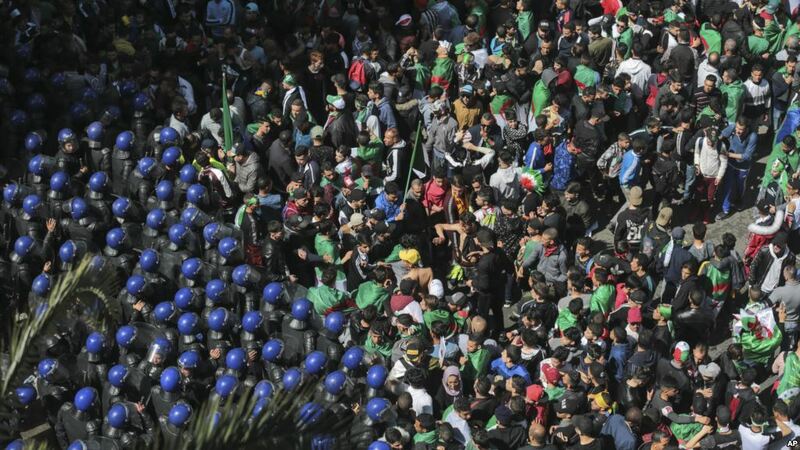 Hundreds of thousands of protesters demanding the departure of Algeria’s ruling elite rallied in the North African nation’s capital on Friday and police reported nearly 200 arrests after clashes that left more than 80 officers injured. Police in anti-riot gear fired tear gas to disperse a crowd of several hundred youths in the city center, witnesses said, after an otherwise largely peaceful march joined by families throughout the day. 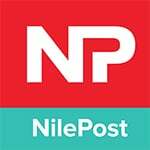 Police arrested 180 people after clashes with “infiltrators” among the demonstrators who injured 83 policemen, a police statement said. 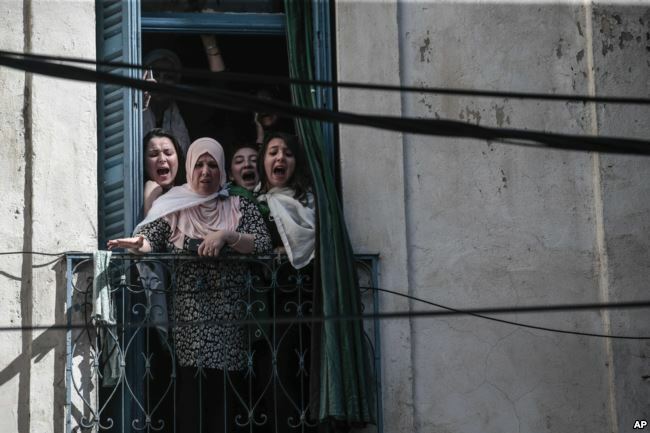 Women react from their balconies as police clash with protesters during a demonstration against the country’s leadership in Algiers, April 12, 2019. President Abdelaziz Bouteflika stepped down after 20 years in power 10 days ago, bowing to pressure from the army and weeks of demonstrations mainly by young people seeking change in the country. “No to Bensalah,” the protesters chanted on Friday. Reuters correspondents at the scene estimated the crowd size at hundreds of thousands of people as on previous Fridays, although there was no official count. “We want the prosecution of all corrupt people” and “no to the gang”, said banners held up by the protesters. Many waved Algeria’s white, green and red crescent moon flag. “We came out today to say that Bensalah’s position is unconstitutional,” one of the protesters, who gave his name as Nawal, told Reuters. “We do not deserve military rule. We deserve a democratic and free Algeria,” he added. State television said similar protests took places in most cities. Police in a statement said they had arrested members of an unspecified “terrorist group” and also some foreigners who had planned to incite protesters to violence. The statement gave no details. More than one in four people under the age of 30 are unemployed — one of the central grievances of protesters who want the economy liberalized and diversified to reduce its reliance on its oil and gas production. 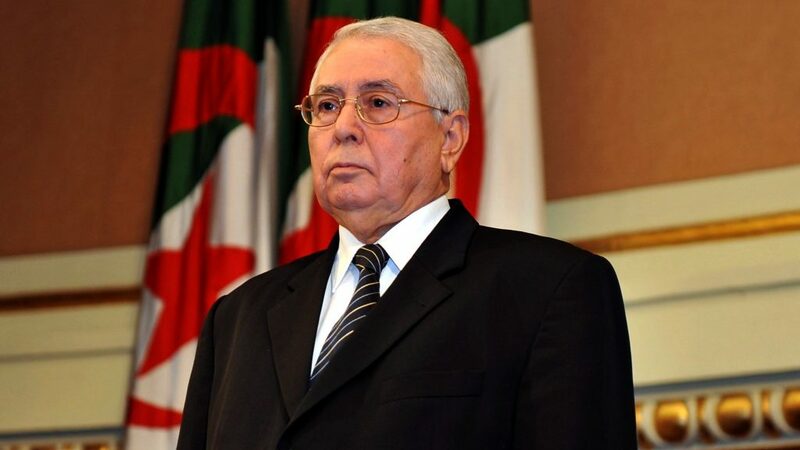 On Wednesday, Algeria’s army chief, Lieutenant-General Ahmed Gaed Salah, said he expected to see members of the ruling elite close to Bouteflika, who he called a “gang,” prosecuted forcorruption and said he would support a transition toward elections. The army initially monitored the unrest from the sidelines. 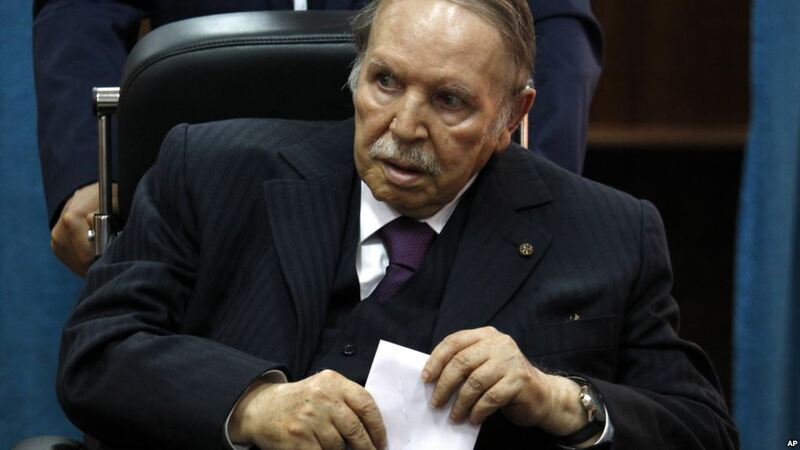 Then Salah intervened, declaring Bouteflika — rarely seen in public since suffering a stroke in 2013 — unfit to rule.